The volatility on global equity markets in August was at its highest since 2011. On Black Monday (August 24, 2015), the Dow Jones Industrial Average fell by more than 1,000 points and the S&P500 index plummeted 5.3% in the first four minutes after the opening. During the first 30 minutes, more than two billion shares were traded and, over the morning, the market quickly recovered about half of what was lost during the first four minutes. 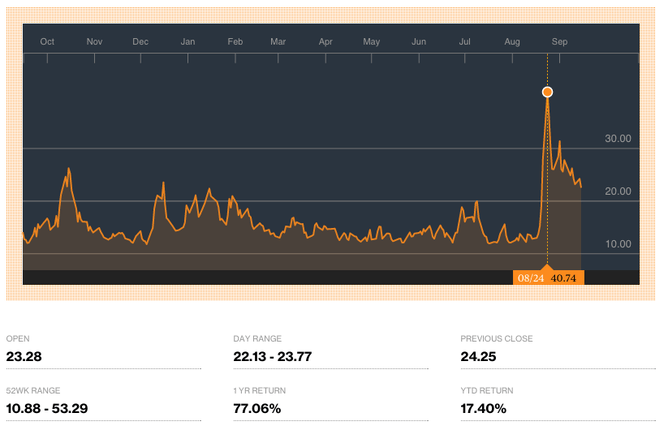 The CBOE Volatility Index (VIX) also known as the fear index peaked that day at 40.74. During less stressful times in the market, VIX values are usually below 20. Values greater than 30 are generally associated with high levels of volatility. For example, during the global financial crisis, the index reached an intraday high of 89.53 on October 24, 2008. The speed of adjustments in the market during the last few weeks have seen many market commentators question whether the higher level of volatility is the “new normal”. For instance, the former European Central Bank President Jean-Claude Trichet suggests that “we have to live now with much higher, high-frequency level volatility”. What has changed and who are the market participants that are contributing to the high-frequency volatility that we are observing? The chiefs of banking giants Commonwealth Bank and ANZ have laid the blame on high-frequency traders. ANZ chief Mike Smith argues HFT is a problem because it’s moving the market “very, very dramatically both ways”. High frequency traders use computers and complex algorithms to move in and out of stocks very quickly. These movements are typically milliseconds apart, involving the trading of very large volumes of shares. Some market commentators believe HFT has intensified the recent volatility by causing the market to react rapidly to news that may not be significant. In response to the market swings that we are currently experiencing, some argue that the reactions observed are much more volatile than what is expected. Doug Cifu, the co-founder of one of the largest electronic market making firms in the world and biggest high-frequency trading firm, Virtu, has defended the role of HFT. Virtu trades about 11,000 financial instruments in 225 markets across 35 countries. Cifu argues that HFT does not cause volatility but absorbs volatility as they participate in the market as a market maker. Market makers help the trading process by acting as the counterparty when others want to trade, and earn a fee in the process. High-frequency trading firms have argued they provide liquidity to investors and make trading cheaper by reducing spreads between bids and offers across the markets. My colleagues and I at the University of Western Australia Business School and University of Nagasaki studied the effects of HFT on liquidity on the Tokyo Stock Exchange. We found evidence to support the argument that trading by high-frequency trading firms improves market quality during normal market conditions. This is consistent with prior research conducted using data from the New York Stock Exchange. However, we found HFT does not improve market quality during periods associated with high levels of market uncertainty. This is particularly worrisome because high frequency traders appear to consume liquidity when liquidity is needed the most. Market operators and regulators have considered different strategies to increase market stability. Some have implemented circuit breakers to halt trading when the market moves by certain percentages, while others have considered imposing transaction taxes on high-frequency traders. In response to the latest market swings, the China Financial Futures Exchange (CFFE) took a more drastic response by suspending 164 investors who were found to have high daily trading frequency. According to the China Securities Regulatory Commission (CSRC), the trading by these investors is believed to amplify market fluctuations. In the US, it is estimated that about three-quarters of daily trading is by HFT and ETFs using “slice and dice” type strategies. In an Australian Securities and Investments Commission report released in 2013, HFT is found to account for 27% of total turnover in S&P/ASX200 securities. These traders are unlikely to go away. It’s now important for us to get a good understanding of what is the new normal. This is what will help regulators in their tough task of monitoring and ensuring market stability.